Mountain passes might not be the quickest route across the Alps but they are the most scenic. They make a summertime drive a real pleasure and a chance to get back to nature. However, the most magnificent peaks deserve the best set of wheels to complement the view. Those hairpin bends and high gradients demand precision handling and powerful engines, so why not hire a luxury car for your journey? A luxury car rental will ensure that you and your family enjoy the safest most comfortable drive at the highest heights. An SUV rental in France is perfect for tackling all surfaces and altitudes. Here are four of our favourite mountain passes in the Alps. This alpine road in the Eastern Alps in undoubtedly one the world’s most scenic drives. The highest surfaced mountain pass road in Austria is best driven early in the morning to be enjoyed without the huge crowds it attracts. The 48km pass extends across the provinces of Salzburg, Tyrol and Carinthia and bisects green mountain pastures, colourful meadows, rocks, waterfalls and hills to the heart of Austria’s largest national park. The mountain peaks in this area soar to heights in excess of 3,000m, but the highlight is Grossglockner itself, Austria’s highest mountain at 3,798m. The highest point on the road is the Edelweissspitze at a heady 2,500m, but make sure you stop at Kaiser-Franz-Josefs-Höhe (2369 m). This is the location of the Pasterze Glacier and spectacular views of Grossglockner. The road has a toll, but for the smoothness of the asphalt and the views, it’s well worth the fee. The Col de l’Iseran is the highest paved mountain pass in the Alps, at an elevation of 2,764 metres above the sea level. Situated in Savoie in France near the border with Italy, it links the valley of the Isère and the valley of the Arc River between Val-d'Isère in the north and Bonneval-sur-Arc in the south and is a great opportunity for luxury car hire in France. It’s part of the famous Route des Grande Alpes between Lake Geneva and the shores of the Mediterranean. The road is open from May/June to October, but because of its high elevation it can be closed at any time due to snowfall. The road has been used five times in the Tour de France since 1947, attaining a legendary status and being feared by cyclists. The asphalt road is the perfect place to test drive a luxury car rental like the ultra-chic Aston Martin Vanquish. 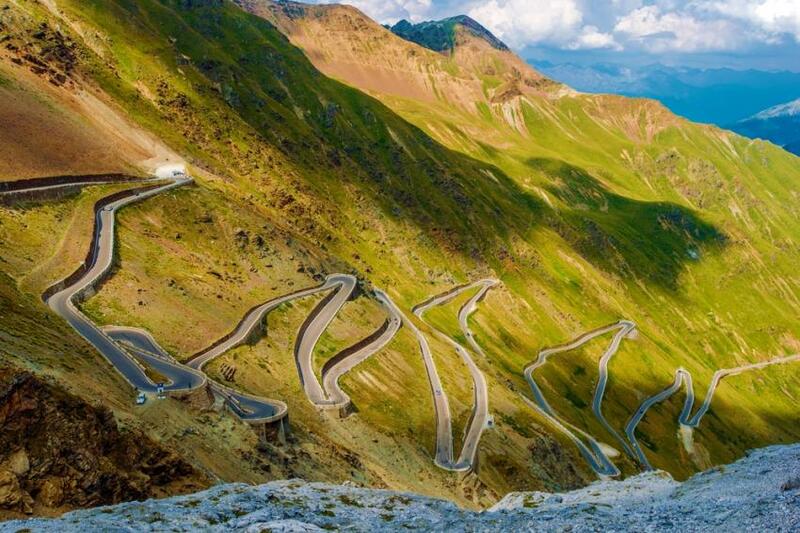 The Top Gear team declared northern Italy’s Stelvio Pass one of the best driving roads in Europe. High praise indeed from people who have a lot of experience driving awe-inspiring roads in the world’s flashiest cars. The road is 49km long and has 75 turns, many of them hairpin bends. Its main claim to fame is that it’s the second highest in the Alps (after Col de l’Iseran) reaching the dizzy heights of 2757 m. The summit is called “Piz de la Trais Linguas”, which means “Peak of the Three Languages” in English – appropriate since this is where the borders of Switzerland, Austria and Italy once met. It was once an engineering wonder when the Austrian Empire built it, but that was before Austria lost all its territorial claims in the area as a result of the two world wars. It certainly provides great views and draws thrill-seeking drivers in spades, so why not hire a Lamborghini Huracan Spyder as a nod to the Stelvio’s Italian connection. Close to the Stelvio Pass, but in Switzerland, you'll find a faster, wider road: the Gotthard Pass. This mountain road is located in the centre of the Alps and has always been an important symbol of Switzerland’s culture and national identity. It’s the cradle of the Swiss Confederation, the scene of resistance against wartime occupation and, most importantly, the link between northern and southern Switzerland. The road has all the obligatory views you could want and despite the usual hairpins, there are fewer blind spots than most passes and even some straight stretches. In fact, the Gotthard Pass is a blend of everything you could ever want in a great driving road and perfect for an SUV rental like a Range Rover Sport. It is now accompanied by several road and rail tunnels of the same name. If you would like to rent a luxury car to drive any of these stunning alpine passes, please take a look at the marques and models we have available or contact us for more information.